Samantha-Jayne Ludbrook has been practising Magnified Healing® an beautiful interactive energetic healing since June 2013. She loves to be able to be a vessel for the healing of this method. This HEALING was first introduced to earth in 1983. Previously, this healing method was used only in the higher dimensions by Ascended Masters to assist the Masters on Earth and mankind under special divine dispensation. In 1992, under direct intervention and inspiration of Lady Master Kwan Yin, Magnified Healing® of the GOD MOST HIGH OF THE UNIVERSE was brought forth into its expanded form for the spiritual advancement of Humanity and the Earth. Magnified Healing® establishes a constant flow of Energy from your heart to the Source, the GOD MOST HIGH OF THE UNIVERSE, through all of the Spiritual Centres, down to the Diamond at the Centre of the Earth. The link spirals and brings a deep state of grace pulsing forth from the Source, laying the very foundation for the Ascension process. Magnified Healing® is the name chosen by Kwan Yin for this modality. She tells us She is the spokesperson for God and the Hierarchy in bringing it forth to humanity at this time. It is co-created and magnified with God, (the Source, the All That Is, The Universal Mind), hence the name “Magnified Healing® of the GOD MOST HIGH OF THE UNIVERSE”. Kwan Yin emphasizes that She did not originate this healing, but it is a gift from God, therefore we do not call this modality “Kwan Yin’s Healing” or “Kwan Yin’s Magnified Healing”. 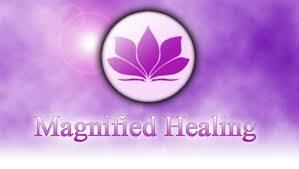 Magnified Healing® of the GOD MOST HIGH OF THE UNIVERSE is what we do. We hold it in sacredness and in the highest holy order. We acknowledge Kwan Yin for bringing this healing technique to Earth, and constantly sustaining each of us and Magnified Healing® with her loving presence. Her flower and electronic pattern are the five-petaled lotus.